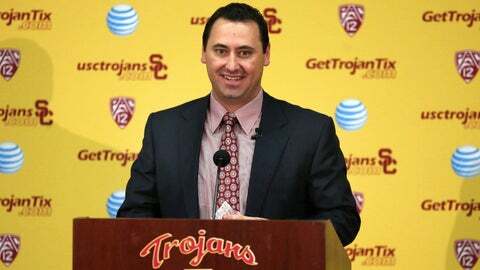 Steve Sarkisian was formally introduced Tuesday as USC's new head football coach. By the time Steve Sarkisian officially accepted the USC head coaching job Tuesday, he had transformed, morphing from an old face with stress and weary hours coalescing under the eyes to a bright, rejuvenated man. Monday was tough, waking up as Washington’s coach and telling a local radio station he didn’t interview with USC only to end it standing outside USC’s John McKay Center wearing a new shirt and holding a new job. Monday was tough for USC athletic director Pat Haden, too. He had to tell Ed Orgeron – a man Haden clearly loves and called “one of the greatest Trojans of them all” – he wasn’t cut out for leading the program he coached to a 6-2 record on an interim basis this season and would do anything for. “This has been the hardest two days of my life,” Haden said. From the moment word broke Monday that Sarkisian was heading home, reactions were driven by emotion. Most were underwhelmed by Haden’s choice. Counterarguments to the hire could be made, but too few opted for that, choosing irrational discourse that flattened most attempts at level-headed evaluations. Emotion-laced presumptions were boiling by Monday afternoon, forming a simple, inescapable narrative: Haden failed. From my view, five popular emotional responses emerged. Let’s consider them with after a day of digestion. Trojan fans wanted a Glamor Name to announce the progression of USC’s program out of the Lane Kiffin era and into something resembling what used to be. Sarkisian didn’t meet that standard, and so surface-level math commenced and Haden was judged when the sum didn’t inspire. Two things were missed in that calculation. First, who was the splashy hire available? Kevin Sumlin signed an extension with Texas A&M last weekend. Boise State’s Chris Petersen has been courted for years but never lured out of Idaho. James Franklin has done great work at Vanderbilt and will likely be on his way up soon, but he doesn’t currently possess the Southern California recruiting channels Sarkisian does, which USC needs to mine immediately. Jon Gruden’s got a pretty sweet gig, and if he returns to coaching, it’s likely for an NFL opportunity. Second, Haden’s criteria for what a USC head coach looks like are far different – and deeper – than any set most fans would assemble. Those factors go beyond wins and losses and recruiting juice, the only things most fans care about (which, to be fair, can be argued are the ultimate barometer). Haden stated some Tuesday: proven success as a head coach; leadership ability; the appropriate skills to connect with the wide range of people that’s required in a job like USC. Most of that is the infrastructure that nobody pays attention to until it’s suddenly crumbling. Long, Haden, Sarkisian, everybody in this business understands results determine futures. It was Haden’s job in this process to determine who and what would deliver those results, not what name would resonate in the immediate churn of instant reactions. 2. Why did Coach O have to go? GOD BUILT US TO LAST. I LOVE YOU TROJAN NATION. FIGHT ON ! Orgeron took over after Kiffin was fired in September and began with little cosmetic maneuvers designed to charge the troops and reestablish morale. Cookies for linemen. Desserts at team meals. In-N-Out burgers rolled into a team meeting without announcement. It was chemistry curation at its finest, the best of Coach O’s magic touch, and it worked on this group. Feel like I lost my dad again……..
That doesn’t change the source of the reaction, though. The emotion colored everything surrounding Orgeron the richest of USC cardinal, and Haden knew he’d eventually have to fight against that. “A lot of people wanted us to get caught up in a moment of emotion,” he said. There was a wide feeling Orgeron would have been named full-time head coach had USC beaten UCLA last weekend, a sentiment Haden refuted. This multi-year decision wouldn’t be determined by one game, the AD said. Whether Haden got the Sarkisian hire right will be determined down the road, but it’s fair to say now he got the process. This argument against Sarkisian is as silly as it sounds. The two coaches are friends, not diabolical twins. They coached together on Pete Carroll’s USC staffs, and after Kiffin was fired in September, he visited Sarkisian in Washington for a week and even did his first public interview there. When Washington and USC played each other in the last couple years, some jokingly called it the “BFF Bowl” because of the friendship between the head coaches. Those familiar with the programs and both coaches say Sarkisian and Kiffin have significantly different personalities. Kiffin is a bright offensive mind who might lack some of the people skills to be a head coach. Sarkisian is seen as a personable teacher who easily connects and possesses the charisma to publicly lead. They’re different people. That’s where this should end. I never really understood this stance. The desire to distance the program from the sanctions that accompanied Carroll’s tenure in regards to Reggie Bush is understandable, of course, but everything about the era is bad? In Sarkisian’s seven seasons as a USC assistant, the Trojans went 74-15. He was part of the 2003 national championship team, and while he wasn’t on the 2004 national title staff (the one later vacated by the NCAA), he consumed large quantities of one of USC’s most successful eras. Why neglect that experience? Part of me wonders how the perception of that era would change if the sanctions were more reasonable. We can likely agree, given how the NCAA has ruled in subsequent cases, that USC’s two-year bowl ban and loss of 30 scholarships over three years was excessive for a player’s parents taking money and free housing from an agent. That’s not the case, however. USC has one more season left of 10 fewer scholarships, and then it will finally be free from the NCAA. Sarkisian and his new staff, of course, should strictly adhere to USC’s compliance protocol so the Trojans avoid a period as muddy as the previous one. Beyond that, I’d argue Sarkisian should embrace everything football-related to the nearly decade of dominance USC enjoyed. 5. Sark had minimal success at Washington, and so how is he a fit for USC? This seemed to be the most common reaction, and it’s a fair argument to make, but context shouldn’t be lost. 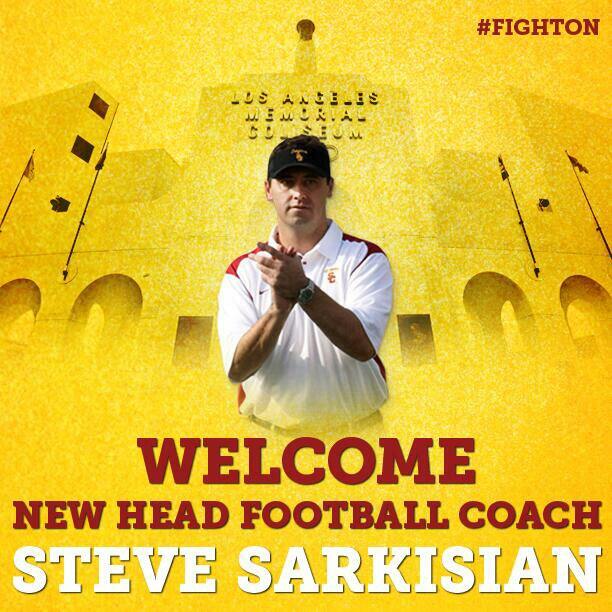 Sarkisian went 34-29 in five seasons at a program that won 12 games in the five seasons before he arrived. He took a broken program and raised it to a level that required UCLA to give Jim Mora a six-year extension Tuesday to prevent him from bolting to his alma mater and the beautiful facilities that sit on Lake Washington. Argue that’s not enough to land one of the three-to-five best jobs in college football if you wish, but results should be weighed relative to circumstance. Not trusting one word a teenager with a Twitter handle like @AdoreeKnows, a social name like ‘SWEET PEA’ and a shirtless profile picture says is one of life’s fundamental rules, but Jackson is onto something here. Haden attributed a significant portion of Sarkisian’s appeal to his relationships with Southern California high school coaches and the ability to turn those relationships into premier recruits. Washington had 51 players from California on its roster this year, and Tosh Lupoi, Sarkisian’s defensive line coach at UW, is said to be a superb recruiter who helped Sark keep the California lines open up north. Lupoi and defensive coordinator Justin Wilcox are rumored to be coming with Sarkisian to USC (although that’s not official and Wilcox could be a candidate for Washington’s head coaching vacancy). All of that will be resolved in the coming weeks. For now, as the dust around USC settles and emotion evaporates, Sarkisian will have a chance to move forward, into his immediate responsibilities of restocking the Coliseum and out of the shadow of Coach O and the voices pleading for a re-do.